In the third annual meeting of the Motricolor consortium, INCLIVA has host a two days meeting in which the different members of the consortia have discussed about the progress of the project. This project has been financed by the H2020 program of the European Commission with a budget around 6 million euros. The main objective is to perform three clinical trials for different populations of patients with metastatic colorectal cancer based on their molecular and gene expression to analyse the antitumoral activity of the different experimental treatments that are going to be tested. In addition, we also want to characterize the safety and tolerability of these treatments, as well as explore the potential response mechanism of the primary and / or secondary resistance to these different treatments and monitor circulating tumor DNA (ctDNA). 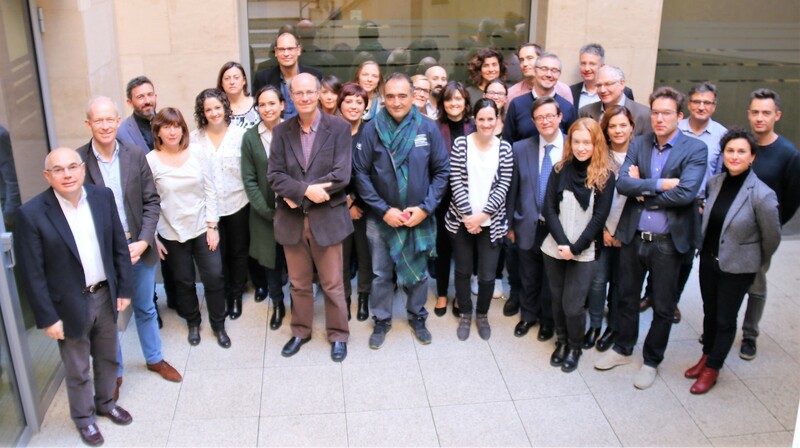 The consortium is led by the Vall d’Hebron Institute of Oncology (VHIO), and as participating partners, in addition to INCLIVA, is the Catalan Institute of Oncology (ICO), the company Agendia BV (Amsterdam), the Netherlands Cancer Institute (NKI, Amsterdam), the European Organization for Research and Treatment of Cancer (EORTC, Brussels), the Niguarda Hospital (Milan), the Seconda Università degli Studi (Naples), the Università degli Studi (Turin) and the Katholieke Universiteit Leuven (Louvain). Throughout the session of the 9th, the coordinators of the project have made a summary of how the project has progressed in the two years that it has been alive and what are the steps to take, and the different work package leaders have made an overview and update of each part of the project. This November, one of the clinical trials is going to be opened in the different participating clinical centers. In the session on the 10th, in addition to discussing other aspects of the progress of the proposal, it was decided that the next annual meeting of the consortium will be in November 2018 in the city of Naples, hosted by the team of Dr. Fortunato Ciardiello. Dr. Cervantes, General Director of INCLIVA and one of the principal investigators of the project, highlights that the meeting has been very useful because it has allowed to address through constructive discussions the different areas of the project, reaching agreements and commitments to advance together in the development of it and reach the final milestone: provide real alternative solutions to patients with metastatic colorectal cancer.